Unique walnut and leather top round coffee table, 1960s, that separates into 4 pie shaped individual table parts, USA. Leather was recently replaced and in excellent condition. Designer or maker unknown. 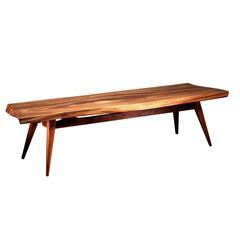 Very unique 3 legged coffee table with organic shaped top, in Walnut, USA, 1960s. 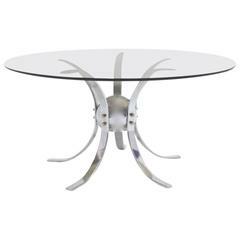 Coffee table or side table French work, frame made of plywood end metal with a glass on the top. 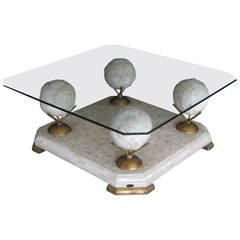 Coffee table made of nice marble on top with walnut base. Excellent condition. Stunning coffee table in great condition. Birch legs with brass caps and a table top in light oak. 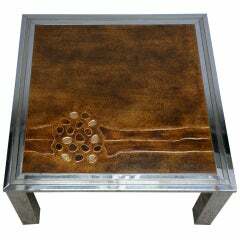 Mid-Century chrome coffee table with one complete hand-painted top in abstract motif with gold brown background.